Personally, I think they should play again. Now they have no deadline, so it would be interesting to see the game played with planned deployments on both sides. Or with the teams taking the opposite side. 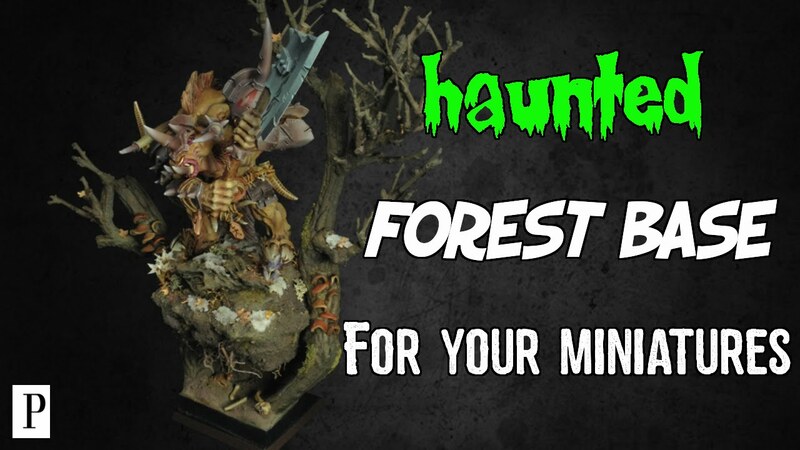 You've got all the miniatures and the lovely battlefield, make the most of them! Finally, I finished the entire written battle report! Like it? Love it! I am stunned at its beauty. This is the most impressive WFB game I've ever seen. Your desire, dedication, determination, and going the distance, wow. The idea that GW didn't respond to this, oh my. Obviously that didn't ruin the fun and joy of the experience. What a gorgeous effort, amazing, brilliant. This have been such a source of inspiration. Well done!! What will happen to all those beautiful miniature and scenery now? They will burn!! hehe, no no. Well, about models half of them are mine and they are now on their proper site: in their showcase. Regarding boards, I made them also thinking about storage, so they are now on the garage, well kept. Waiting for the next challenge. You're a bad Shadespyre. You want pain for us!! No, at least, not in the next five years. What it's true is that we have learned a lot about this kind of games, and we'll apply those lessons on next battles. So now that the report is complete and you the adrenaline has worn of: what are the things you've learned, painting-wise, table-wise, game-wise? what would you do differently if you could do it all again? And, of course, what's next? Painting-wise: First of all, you must have clear what your goal is. Do you want to play with friends and take some fun? High quality painting it's not necessary. You want to record it and upload on youtube to share it with community? High quality it's not SO necessary. And I discovered it on this game. 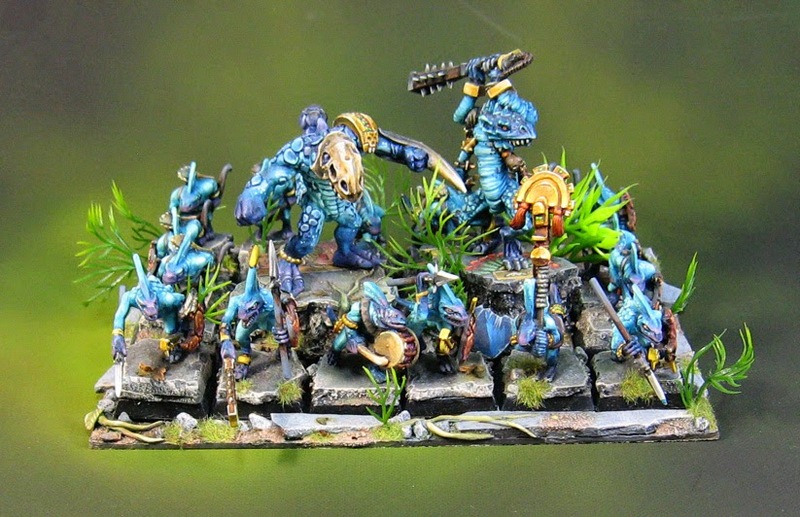 Unless you take some close-up pictures and recording on your models (or winning the painting competition on a tournament), the great efforts you put on your models cannot be valued in general terms. I spent many (MANY!!) hours painting eyes, details, moustaches... you will not appreciated it on the reports. I have to do it. It's my way of painting. But the truth is that it was not so important because this high quality painting will not be taking into account. People will not see it. This is from Hoodling's hole, a member of this forum. 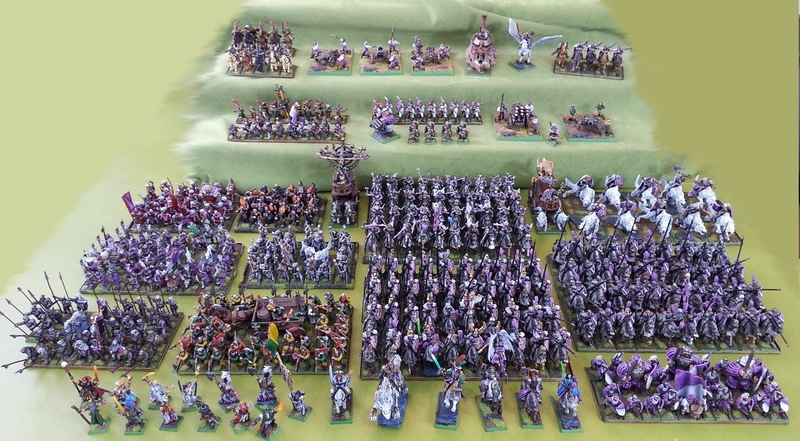 This is, in my opinion, how an army should be: you have 2 or 3 main colours that makes your army easily recognizable. Impossible to confuss with their enemies on the board. Each unit, quick to identify. They are heavily uniform, compact, homogeneous, what means strongness, coherence. This is the opposite side of the coin. Yes, he knows how to use a brush. But (always from my point of view), I don't like it. On the second image you have to make a great effort to recognize what the hell unit is that. This is nonsense. So, in conlusion: less colours, less details, more thinking about appropiate colour scheme, and make contrasted and simple bases. Table-wise: they are expensive. First strike. And this is because if you want to create something good, something that not perish after the first battle, you'll have to buy better materials. Second, think about storage before made it, so fix on the board only essential elements. In may case, only the river, the road and just one meadow are fixed on the table. The rest of elements can be removed. Game-wise: take your time, organize it well and be clear with the roles of every player. And be sure every single detail on organization is over before the game: printing army lists, having enough dice and rulebooks, movement trays, cameras, auxiliary tables, food, chairs... everything around the game. Better if there is a Game Director (not sure if this is the name in english...) who NOT play the battle. But as I said, time and space is essential. Take both as large you can and be sure your brothers in arms understand the hobby and the game as you (mainly, competitive or nor competitive). And take patience. Nait is true about writting here. So, I will explain next projects on the Elector's Forum. And again, thank you all. Sincerely. Your advices and motivational posts helped my very much. Yep, doesn't surprise me either. Doesn't make it appropriate though. WFB has the capacity to live on for a long time. You've demonstrated that through your efforts with this project, and ti's inspirational effects can do nothing but help. When the gaming fatigue has dissapeared, I would run a chaos invasion campaign if I were you. Running a story-based campaign re-enacting the chaos invasion that ended at the siege of Kislev would be epic. Of course, the ultimate game has already been played, but there is room for many other epic engagements with your finished forces. If you ever want to try to re-fight the siege of Kislev again, I would also go with Kings of War as the base ruleset. Then you can very probably finish the game itself in 3, max 4 hours, and much less of the big beasties will die instantly from cannons. First of all: Grand job mates! This has really given me some proper faith in the passion of hobbyists. Maybe the Warhammer legacy really can go on without a profitable company to guide it. You guys keep doing what you do so fine. But I gotta disagree with half of your view on the army painting part. 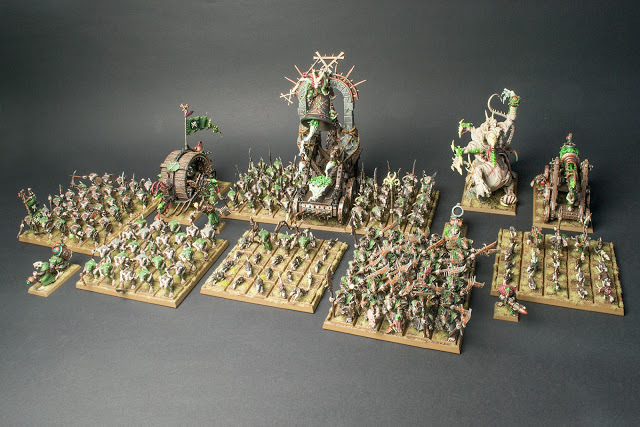 Whereas I also think that the Lizardmen unit you showed us really went too far with the busy uniqueness, I also think the Skaven army didn't go far enough. Armies gotta be coherent and easily recognizable, I give you that, but if you paint an army with no real uniformity in the model/concept design too visually minimalistic, it's gonna look too industrial and unrealistic. I think Hoodling managed the golden middle, but his army is the Empire anyway, whereas the Skaven lot looks like a mass of identical plastic soldiers with little personality or edge. It's practical, but regiments like that don't really give you that special feeling when they achieve something notable on the battlefield. Of course I've got zero experience on the scales even near your project, so maybe none of that is even important in bigger battles. You guys have inspired me to continue pursuing the grandiose hobby projects I had planned in my youth but had begun to fear would never take shape! Such creativity and dedication! I may have missed it somewhere in the 30+ page but, wasn’t there a sizable force of dwarves inside the city aiding the defenders? Well, there is an open discussion here. I'll give you my point of view about these matters, not necessary the best, just my impressions. On the one hand there is a concept about I think every time I prepare a battle: immersion. This is the reason why I never play with unpainted models or over the kitchen table. I did it too, many years ago; but now my goals are bigger and I want to go several steps beyond. So, if I saw some of these models on a gameboard, they don't help me to immerse on the battle, but the opposite. They are remembering me: "I'm just a showcase miniature, not a monster fighting on the battelfield against human soldiers". It seems an earthquake is shaking all this soldiers. BAD! 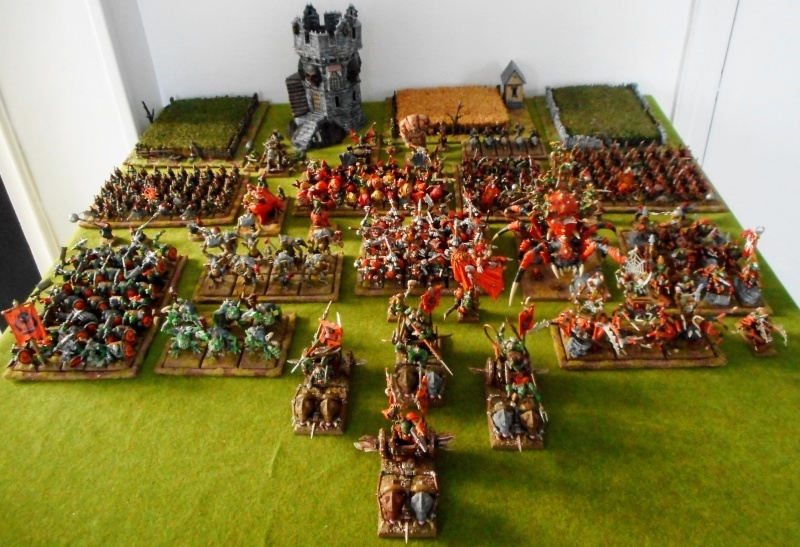 On the other hand, I like Warhammer because of close units, like in the real ancient and medieval battles. I'm a military historian and I know pretty well how soldiers were equipped: not every single soldier wears the same panoply. BUT the general view on the distance they use to look very much uniform: similar clothes, similar weapons, similar phisical appearence... now think in a fantasy world were diferent races fight each other: the difference between them has to be higher. And one trick to make your army strong coherence is using a smaller palette of colors. I don’t see the same plàstic model, I see lots of soldiers from the same province/clan/city. Finally, I don’t know if you have played on tournaments but it’s there, not in massive games, where you can see what exactly I’m talking about. With less models is even more necessary to take them strong coherence. And the very last thing is that on this kind of games you will not see models/units as on internet pictures. You will see them from, at least, 1 m distance, worst light, and just from above. These three items means you will never see details on units; you’ll see it as a whole, as a single bigger model. And, less colors also help the audience to identify this units. So the question every player should make is: I want to paint models for a showcase or for gaming? I think you are right that some models are best kept in a display case and lose much of their appeal when they get put on a gaming table. This has a lot to do with the bases and how well they match the table. In the olden days when all gaming tables mimicked well-manicured golf courses this was easy. Nowadays, not so much. Especially with all these cool mats coming out that come with so many design. Even if the bases don't match the table, a consistent, low-key basing really helps to pull an army together and put the focus on the miniatures. I am a bit torn on the limited palette for an army. 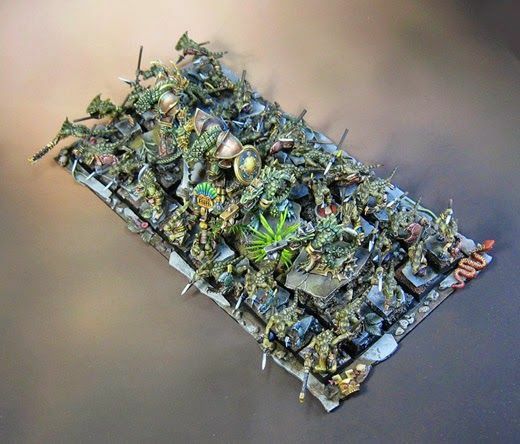 That approach has some merit but, I think it can be overdone and the skaven army further up is an example. That is a bit of a blob of green and brown and nothing stands out. My approach (in addition to the consistent basing) is to keep using some colors throughout the army. For example Empire is often a mix of different provinces and hence livery so the main colors could be different. But, I will use the same color for all the leathers or roughly the same technique for all the metals to maintain some coherency. In the end, do what floats your boat. I am the first to admit that it took me years to finally stop painting eyes that nobody will see anyway from the other side of the table. If I were granted a superpower, either paint at the same quality but much faster or paint like a Golden Daemon but at my snail-y pace...I'd pick the former. Big Armies is where it's at. oh and Rogers, do you want to comment on cannons and steam tanks in large games? Let it all out, how do you really feel about the Empire? Seems to me that their huge threat range makes them a lot more effective in large games. What I mean is the Big Bad Guy can only charge so far and kill so much and might even run out of worthwhile things to kill but, within 72" of the cannon there will always be something worth shooting in large games. And, there is usually such a saturation of cannons and with the rules the way they are you can often shoot cannon after cannon at the high-value target until it's dead, then move over to the next. In some prior editions at least you had to announce targets for all war machines first. I have been contemplating a gentlemanly house rule to the effect that no more than three war machines can aim at the same model (although the exact wording would be a bit difficult). But hey, this is my opinion! Not even me always follow this theory. I just only point out this way of army painting (not models but entire armies) for those of you who has to paint a lot. It's a way to take better advantage of time; reducing efforts and gaining time and results. About my feelings... well, I played with Chaos, and sincerely, empire shooting phase was disgusting for my team. Half of mosters didn't even arrive in close combat, what I really wanted to look: few monsters fighting against hordes of state soldiers. The gameboard, even his 6,6m long was not engough too, so, for your game, think carefuly about it. Maybe one day, we can solve this problems and make an ever better battle! Interesting discussion and seeing the Militia here I wanted to pitch in my part. But the second is overdone in my opinion as Militia is not really supposed to be in to province uniformity, so while the leather and other parts are really nicely done I would rather see less red/blue or less vibrant. My preferred look would be more grey's / blacks on the clothing with little bits of red/blue to tie it in with the Altdorf theme. Totally agree! but I didn't found a picture with greys, blacks and leather as I imagine militia. If you had one, put it here! You can argue various cases for the level of uniformity for Militia. They are some sort of part-time force who come together for emergencies:- but there are different levels. For example the Territorial Army in the UK, or the National Guard in the USA both wear very set uniforms, and do regular training. At the other end of the scale a small town might have a local neighbourhood watch who mainly wear civilian clothes and might identify with an armband. If your army has fluff, then the 'wealth' of its fluff could determine how co-ordinated your Militia Troops look. A City Watch might supply jackets helmets and weapons - a small town might expect you to bring your own spear or sword. Aye. The question is what kind of army do you want. I don't want an historic army, nor a completely fantastic army; simply trying to find the balance. And in that matter, painting with very few colors, even not painting them in the same parts of the model, can give us the point. I love the militia, but personally prefer for them to have a less uniformed look, like a bunch of mercs and outlaws. Rogers, congratulations to you and your friend for this project. I read your thread this since the beginning and its amazing to see it in his final phase. For your analys about army paiting, I can't be more agree with you, because its my way to go for my 2 army. The key is to find the perfect balance betweem time spent on painting, quality painting and ambition. For example, I cleary don't have your level on individual painting, but i'm more confortable on paiting an entire army. This is how I painted my 2 army these last 10 years. The process has to be different : you have to take the time in consideration, your motivation, your ambition... And there is always some choise to make if you want finish your army relatively fast, and play it fully painting on the battlefield. Thank you very much Alex. Totally agree with your statements and glad to see your follow them! 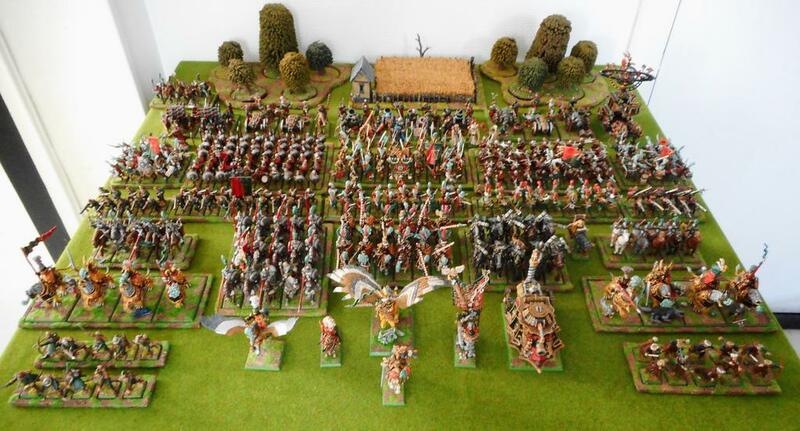 Glorious armies, as I like it: few characters, lots of large units. 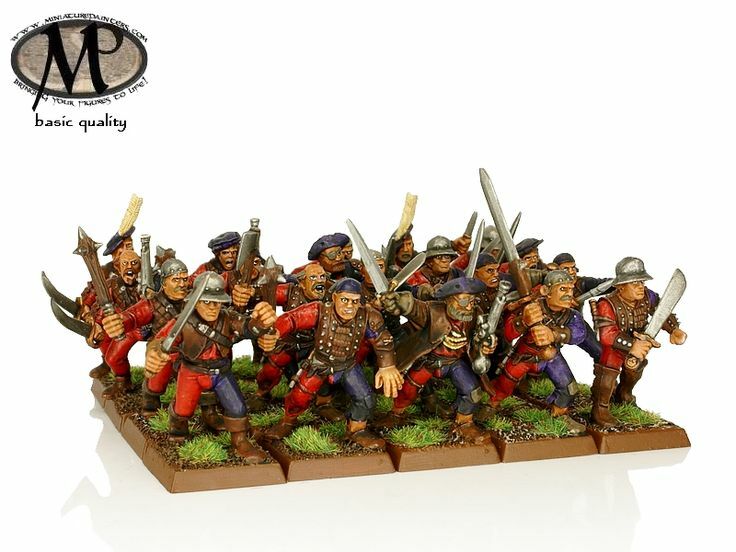 In fact, if you have 40k points and maybe half is spent on ogres, dwarfs, flagellants, knights and other non-state colored troops, that allows you 2000point armies for ten provinces right there. Though in 2301 there would be 11 liveried provinces as the Westerland (Marienburg) would be still considered part of the Empire and it's last Count, Paulus van der Maacht, died during the war whilst on campaign with Magnus perhaps even during the battle itself. That skaven army has never worked for me. I'm sure the painter is very skilled but it so blah. Finally published the video-battle report about the game. I'am afraid it's in spanish, but first 15' includes the background of the Great War against Chaos I'm sure most of you will recognize.